The Humane Society of the United States (HSUS) was established in 1954 and is currently the nation's largest animal protection organization with a membership of 11 million (one out of every 28 Americans). The Humane Society of the U.S. endeavors to reduce suffering and create social change for animals by advocating for sensible public policies; conducting cruelty investigations; enforcing existing laws and working with corporations on animal friendly policies. They also educate the public and conduct hands-on programs. HSUS programs include disaster relief for animals and direct care for thousands of animals in their sanctuaries, rescues, wildlife rehabilitation centers and mobile veterinary clinics. They also provide guidelines, evaluations, training programs, direct support and national conferences for local humane societies. HSUS publishes a bi-monthly magazine for shelter personnel. HSUS is building a Humane Wildlife Services program for homeowners and businesses to provide humane and effective alternatives for dealing with conflicts with wildlife. HSUS confronts national and global cruelties through major campaigns which target barbaric practices of dogfighting, cockfighting, puppy mills, factory farming, "canned hunts" of captive exotic animals; horse slaughter, seal hunts and the commercial fur trade. Their track record of record of effectiveness has led to meaningful victories for animals in Congress, state legislatures, courtrooms and corporate boardrooms. 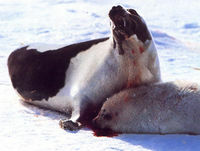 Approximately 10 billion land animals are raised and killed for food every year in the U.S. (over a million an hour). HSUS asserts that farm animals have individual personalities, curious natures and preferences and suffer from pain, boredom and frustration. Hundreds of millions of animals are intensively confined in restrictive pens, cages and stalls where they are unable even to engage in basic movement. No federal law protects them from cruelty. In fact, states exempt "customary agricultural practices", no matter how abusive, from animal cruelty statutes. HSUS has documented what they describe as routine mistreatment on industrialized factory farms in undercover investigations and videos. See also animals raised & hunted for food. "If this is the best that Smithfield can do, it is evident that there are terrible problems in the nation's pig industry. It is indefensible for Smithfield to allow its sows to linger in crates barely larger than their bodies for months on end." "Now that Smithfield just posted its highest ever quarterly profit, it's a good time to make a public pledge to honor its previous commitment. The company can no longer claim that economic circumstances don't allow for facility improvements. Other large pork producers, such as Maxwell Foods, are already gestation crate-free, while Cargill is 50 percent gestation crate-free." Photos and video footage revealed approximately 1,000 large breeding sows. 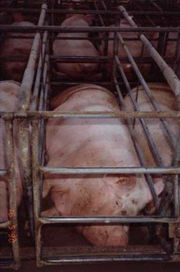 Sows are trapped in their crates for the entire duration of their four month pregnancies. After giving birth, they are moved into a crate large enough to nurse for about 3 weeks before again being artificially inseminated and forced back into gestation crates. In one video, a large, lame pig with the word "kill" spray painted on its back is dragged by the snout after being shot in the head with a stun gun. The struggling pig is thrown into a large trash bin, then breathes heavily as it lay dying and surrounded by dead pigs. ,  See also Smithfield Foods. Horses going to slaughter are shipped on crowded, double-decker cattle trucks without food, water or rest for over 24 hours. Pregnant mares, foals, injured and blind horses are shipped for slaughter. Under cover footage obtained by HSUS shows fully conscious horses being shackled and hoisted by their rear leg to have their throats slit. It is particularly difficult to align them to the captive bolt gun that renders them unconscious, since horses are skittish by nature. According to the U.S. Department of Agriculture, 92.3% of horses sent to slaughter are not in danger of abandonment or neglect. The remaining 7 to 8% may require rescue or have to be placed into one of over 400 horse rescues and sanctuaries in the U.S. or simply be humanely euthanized. According to HSUS, it is market forces which dictate the horse slaughter industry. At least 5,000 horses have been imported into one of the three foreign-owned slaughter plants in the U.S. since August of 2004. In California, where horse slaughter was banned in 1998, there was no corresponding rise in cruelty and neglect cases. However, horse theft dropped 34% after the ban. There are hundreds of equine rescue and retirement facilities which rescue horses from slaughter. The New York Racing Association sponsors the Ferdinand Fee for retired racehorses in honor of Ferdinand, a former Kentucky Derby winner who went to slaughter. See also War on Animals, section 3. Approximately 50,000 foals are born out of the Premarin (Pregnant Mare Urine) or PMU industry annually, most of which are sent to slaughter for overseas markets. The approximately 40,000 horses comprised of 20,000 mares and their foals, has created an impossible burden for existing rescue facilities, groups and sanctuaries. The majority of PMU farms are lacated in North Dakota and Western Canada. For more information on the abusive PMU industry and the health dangers of the drug Premarin, see also Premarin. Over two million dogs and cats are slaughtered each year for their furs and skins, mostly in China and other Asian countries. China produces 85% of the world's fur and has no animal welfare laws. A Swiss Animal Protection Agency documented the slaughter of millions of dogs and cats being bludgeoned, hanged, bled to death, and strangled with wire nooses. Investigators documented 50,000 to 100,000 cat pelts stockpiled at animal byproduct factories in China. At least ten dogs are slaughtered to make a single coat, more if puppies are used. Up to 24 cats are slaughtered to make one fur coat. Dog and cat fur is used in trims, linings, hats, decorative figurines, and folk remedies. Skins are used in dog chew toys and shoe leather. Since 1997, HSUS and Humane Society International (HSI) have investigated the international fur trade from Asian countries to wholesalers in the U.S., Russia and the European Union. In the Asian fur trade, cats are strangled inside their cages as other cats look on. Dogs are noosed about the neck by metal wires and then slashed across the groin. The wire noose cuts into their throats as they struggle before losing consciousness. In Harbin China, investigators from HSI documented a German shepherd still blinking and conscious as he was being skinned. Although dog and cat fur is banned in the U.S., the U.S. Fur Products Labeling Act exempts products $150.00 and under (the price range for fur trimmed garments and accessories). ,  See also War on Animals, section 5 on animals used for clothing. See also puppy mills & Missouri puppy mills & Prop B. Dogs are naturally social beings who thrive on interaction. A dog chained to one spot for hours, days, months becomes neurotic, unhappy, anxious and often aggressive. In some cases, a dogs neck becomes raw from improperly fitted collars and constant straining to escape. Dogs have even been found with collars embedded in their necks from years of chaining. Dogs are protective of their territory and respond to perceived threats with an instinctive "fight or flight". When a chained dog cannot escape from a perceived threat, he will often attack an unfamiliar animal or person who unwittingly enters his/her territory. Tragically, victims of dog attacks are often children. A tethered or penned dog who escapes from confinement is also more likely to chase and attack people and pets. Over 100 communities in over 30 states have passed laws that regulate chaining and penning of dogs. See also War on Animals, section 7 on companion animals. On September 8, 2010, the EU voted in favor of a ban on the use of great apes, as part of drastically tightened rules to scale back the number of animals used in scientific research. See also AIDS industry. On November 18, 2010, HSUS joined joined former Gov. Bill Richardson, the Physicians Committee for Responsible Medicine and the Animal Protection of New Mexico at a joint press conference to request the USDA stop the transfer of retired chimpanzees in Alamogordo, New Mexico, to the Southwest Foundation for Biomedical Research. See also SFBR. Anti-HSUS propaganda and disinformation campaigns are generated by industry front groups such as the Center for Consumer Freedom (CCF). Such organizations have clients who have been subjects of campaigns and investigations for animal cruelty and welfare violations. They also perceive the general direction of their advocacy as a threat to commercial interests. See also A visit to the ActivistCash.com web site & Richard Berman cares about animals: clients exposed & Missouri puppy mills & Prop B. Not only do these groups have no interest in animal welfare, they often campaign directly against animal welfare legislation and perpetuate overpopulation. The National Animal Interest Alliance (NAIA) is particularly concerned with HSUS's spay/neuter, anti-puppy mill and anti-horse slaughter advocacy. NAIA director and founder, Patti Strand, is a board member of the American Kennel Club (AKC), which is funded by commercial dog breeding operations or puppy mills. See also NAIA & AKC. The Americans for Medical Progress (AMP) is also an industry-funded organization whose clients have been subjects of HSUS campaigns. EarthVoice, the Center for Respect of Life and Environment and the Wildlife Land Trust are affiliates of HSUS. See also Humane Society International. This page was last edited on 12 October 2017, at 18:04.